Essential fatty acids nourish the skin and fur to prevent excess moulting. Plant fibres help carry hairs through the digestive system quickly and safely. Swallowed hairs clump together less and can be digested and expelled normally, avoiding painful coughing and vomiting. 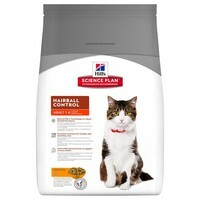 Hills Science Plan Hairball Control Adult Cat Food is a healthy, complete daily food, formulated to meet the nutritional and energy requirements of adult cats up to 7 years old. I started with the small bag, my cat eat every bit so I'm back for a big bag, excellent service by Vet UK.